Modern Espresso UltraCraft kitchen cabinets “destiny line” the door is a Thermofoil and the style is called adriatic. Hanstone Bianco Canvas quartz countertop, the edge is a “V Fold” 2-1/2″ thick. All the best qualities of natural stone without the risk of staining. Backsplash is white marble glass backsplash tile. Very modern brown kitchen cabinets with Top Knobs (M1286) door handle comes with variety of sizes. Designer used 8″x8″ orange color Mexican floor tile. Stainless steel garage roll up doors also stainless steel appliances. Glass and marble mixed white kitchen backsplash gives contract with espresso kitchen cabinets. 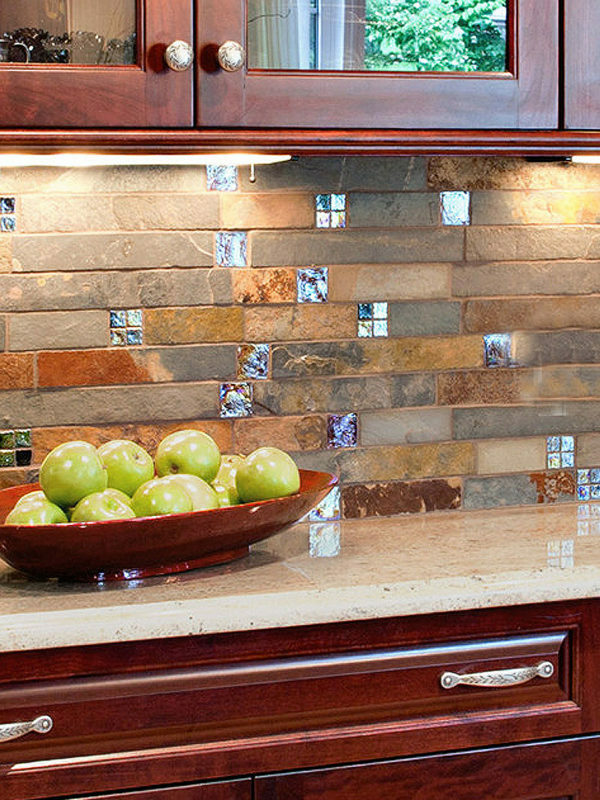 Get more info regarding glass tile backsplash. This entry was posted in GLASS, GLOSSY, MARBLE, MARBLE & GLASS, MODERN, MOSAIC, SUBWAY, WHITE. Bookmark the permalink.